Frank Unwin obituary via The Times: Soldier who escaped from a prisoner of war camp in Tuscany in 1943 and never forgot the Italian peasants who befriended him. You'll be £25.00 closer to your next £10.00 credit when you purchase Escaping Has Ceased to be a Sport. What's this? Order within the next 2 hours, 39 minutes to get your order processed the next working day! After being taken prisoner at Tobruk and transported to Italy, the author was determined to escape and learnt Italian by talking to the sentries. His first escape lasted just one week. He then joined a tunnel party and escaped again. After six weeks on the run he was offered shelter in a Tuscan hilltop village, Montebenichi. There he enjoyed five months of freedom, living the lifestyle and ancient customs of these peasant people. While attempting to re-join the Allied armies, Frank and two fellow POWs were re-captured and sent to a brutal work camp in Germany. His defiant attitude exacerbated an already difficult situation. In March 1945, with the Allies closing in Frank took part in ‘The Long March’, walking for several weeks before being released by American troops. 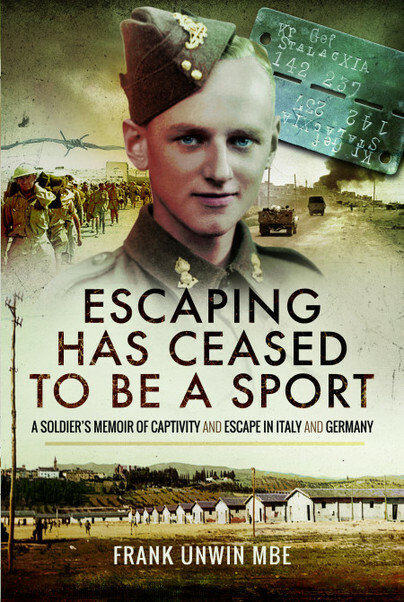 The title of this remarkable and moving memoir results from a notice posted to Frank’s amusement in all POW camps saying ‘Escaping has ceased to be a Sport’. This is an exceptional Second World War POW account by a man who refused to accept captivity. Frank’s memoirs are not so much an account of an escape attempt and its intricate planning but rather a multiple of escape attempts. Despite the book’s alluring dustcover it is not merely about escape at all but one man’s search for freedom amidst the chaos of war and incredibly how he managed to find it. Mr Unwin’s book is easy to read and feels comfortable, like sitting down and having a chat with your grandad. It’s very conversational and it tootles along rapidly enough. It’s interesting and although there is little suspense contained (his escape and recapture are detailed early on), it is still well worth a read and I found myself having a quiet little toast to Frank and those Italian villagers. This is a very nicely written memoir with a very interesting photo plate section taking the story through and on to 2008. In its telling, it offers several unique insights and adds to the picture of life for POWs in Italy and Germany and of their joy to return eventually to their homes. Born in Liverpool in July 1920, Frank Unwin joined the Territorial Army, enlisting in the Royal Artillery aged 18. He saw action in North Africa, Greece, Crete before being captured at Tobruk in June 1942. His experiences as a prisoner of war are the subject of this memoir. Tragically his 12-year-old sister was lost at sea as an evacuee child bound for Canada. After the war, Frank worked for the Ordnance Survey. Having tasted other cultures in the war he joined the Foreign Office and, together with his wife Marjorie and to children, served in Cuba, Israel, Laos, Italy, Canada and Nigeria, mostly as a consular officer. Frank returned year after year to Tuscany and kept up with his wartime friends and their descendants around Montebenichi and the surrounding area. Following the death of his wife, Frank lived in Kent until his death in February 2019.